Learn about Lisbon, Portugal, by reading Lisbon's New Age of Discovery by Gary W. Bloom, WTA Member and Leisure Traveler/Writer. It features all you'll need to know to plan your trip including how to get there, objective information on places to stay, and eat, and things to do. At the end of the article, we've provided a summary of the contact information for your easy reference. Enjoy! There is a popular saying here that "Portugal is Lisbon and the rest is just landscape." The city's historic importance and beauty are without question, with most travelers agreeing that it is one of the most beautiful cities in the world. Lisbon's name derived from Latin means "delightful little port." It may not be so little today, with over one million residents, but it is every bit as delightful. The city is centered on the river Tagus, whose path leads 500 miles from Spain to reach Lisbon and the Atlantic. The river's importance to the city was so great that streets are numbered according to their position in relation to it. Lisbon is one of the oldest cities in the world. There were settlers here as early as 7000 BC and by 3000 BC the city was a thriving seaport. The Phoenicians first occupied the area, followed by the Greeks, Romans, and the Moors. Lisbon became Portugal's capital in 1255. During the Age of Discovery, the explorers embarked from Lisbon in search of far off lands. Portugal's empire expanded not so much from practical and planned conquests as by its explorers' accidental discoveries. The voyages of Vasco de Gama and other Portuguese explorers gained territories in Africa, India, Brazil and Macao. Portugal ruled Macao until 1999, the last European power in Asia after Britain left Hong Kong in 1997. Lisbon is the architectural benefactor of the riches spent on monuments, palaces, and churches by the once mighty empire. Lisbon was on top of the world in the eighteenth century. A thriving port and center of trade with Portuguese territories throughout the world, the city was a showpiece for the powerful empire. All that changed on November 1st, 1755, All Saints Day, when much of the city was leveled and 40,000 people died. Only two sections of Lisbon were largely spared - the Bairro Alto and the Alfama. The Alfama, or Old Quarter, has changed little since medieval times. The coat of arms above many of the doors here attest to its once rich and noble past. It is now a working class neighborhood, home to fisherman and sailors and the legendary fado, the song of the Portuguese people. Like the Alfama, fado speaks of a squandered past. Fado, which means "fate" in Portuguese, is a song of nostalgia and despair for what has been lost and what might have been. Portugal, now relatively obscure, was once one of the mightiest countries on earth. The Alfama is a labyrinth of narrow stone streets, archways, stairs, and courtyards. Carts of fresh fish are displayed outside groceries and laundry is hung to dry on balconies. Small closet-like shops are chiseled out of the concrete walls, selling bread, wine, and other day to day staples. The streets of the Alfama, barely 4 feet wide, were designed for horses. The houses are just inches apart, inspiring the Portuguese poet Frederico de Brito to write, "Our lips easily meet high across the narrow street." The houses are encased in beautiful azulejo tiles. The Alfama is home to Saint George's Castle, Lisbon' oldest structure. 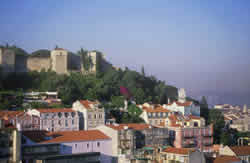 The Castle rises above the Alfama and gives one of the best views of the city. The Moors built the Castle in the ninth century and the site was once a Roman outpost. When the Portuguese re-conquered Lisbon, the castle was turned into a royal palace. Many of Portugal's most important historical events have taken place within the Castle's walls. Kings have been born here, and Vasgo da Gama was received at the castle after his historic voyage to India. Like the Alfama, the Bairro Alto is a step back into Old Lisbon. But whereas the Alfama is a working class neighborhood, the Bairro Alto is filled with small bars, discos, and cafes. It is the center of nightlife in Lisbon. The area attracts a literary crowd, and is home to many of Portugal's prominent writers and artists. With all the trappings of modern life, the Bairro Alto preserves the cobblestone streets and ancient buildings that make it one of the most interesting sections of Lisbon. At night, the mournful sound of fado can be heard echoing through the narrow streets. Walking through the Bairro Alto one can imagine Lisbon during World War II when spies from all over the world converged in the small bars and cafes of the city. The Bairro Alto area still offers much of the intrigue and mystic of its cloak and dagger days, though now its many watering holes are filled with conspiring journalists, poets, and artists. The western suburb of Belem, at the mouth of the Tagus and the beginning of the vast unexplored Atlantic, was the starting point for Portuguese navigators facing the dangerous ocean. During the Age of Discovery in the late 15th century the explorers left Belem in their caravels in search of new worlds. The Belem Tower was the last familiar site for many of these explorers. Constructed in 1520 to house cannons to defend the Tagus river and Lisbon, the tower has been used to house political prisoners in the past, but now contains an exhibition of ancient armor and weapons. Before the Tagus changed course, the tower was situated far out into the water. It is closer to land now, but you still must walk across a drawbridge to reach it. The Jeronimos Monastery, also in Belem, was built in 1502 on the site where Vasco da Gama prayed before his voyage to India. It is a symbol of the great voyages taken by the Portuguese in the 15th century. King Manuel I built Jeronimos as a dedication to Portuguese explorers. Lining the nave of the monastery are the tombs of Vasco da Gama and Luis de Camoes, Portugal's greatest poet. It was the sale of spices brought back by the explorers that financed the monastery. The nautical influence is everywhere. The columns in the cloister behind the Monastery are in the shapes of ropes and barnacles and there are carvings of shells and fish everywhere. One section of the monastery houses Portugal's Naval Museum where models and full size Portuguese fishing and commercial boats are displayed. Not far from Jeronimos is the Monument to the Discoveries, opened in 1960. This sculptured caravel has statues of Portugal's most important explorers, with Prince Henry the Navigator at the bow. The Coach Museum, one of Lisbon's greatest attractions, is also near the Jeronimos Church. Housed in an 18th century riding school, the oldest coach on display here carried Philip II of Spain to Portugal in the late 16th century. The Coach Museum is considered the best museum of its kind in the world. Lisbon has become virtually unknown among today's travelers. The relative obscurity has made this one of the least expensive cities in Europe to visit, as well as one of the least touristy. Yet most visitors rate it as one of the most interesting and beautiful cities in the world. Maybe Lisbon's Age of Discovery is just beginning. Portela Airport is about 20 minutes north of Lisbon and is served by many airlines including Alitalia, British Airways, Air France, Delta, TWA, Continental, American, KLM, and Swissair. TAP (Air Portugal - http://www.tap-airportugal.pt/) offers flights from a number of US cities, including New York, Newark, Boston, and Los Angles. Airfare varies widely, depending on airline and schedule, but as of June 2001, round trip flights from the US were available for around $400. A direct flight takes under 7 hours from New York. A taxi from the airport to the city center is about 1500 PTE (about $7 USD). Doubles are about $US 68 to $US 71, including breakfast. This small three star hotel, decorated with nineteenth century tiles, is located near the Jeronimos Monastery. Doubles are about $80 to $100 USD depending on the season, including breakfast. Modern Four star hotel located in the city center in the main shopping district, near Rossio Square and the Tagus River. Considered by locals to be the best hotel in Lisbon, it is located on one of the most fashionable avenues in town. This five star hotel's regular clientele includes film stars, writers, and statesmen. Doubles run from about $125 USD to $190 USD depending on the season. The Portuguese diet relies heavily on seafood, with cod in its many variations considered the national dish. Grilled sardines are another specialty. Shellfish dishes, while more expensive and harder to find, are another good choice. Portuguese beef is not considered to be the best, but pork and roast kid are readily available and of good quality. Portugal is, of course, famous for its port wine, but its red and white wines are also excellent. Lisbon's oldest restaurant, founded in 1784. Once the leading restaurant in Lisbon, it has lost some of its status to up and coming competitors, but is still a favorite of diplomats and writers. Main courses include salted codfish, veal, sole, and crab dishes. Open from 12:30-3pm Monday - Friday and 8-10:30pm Sunday - Friday. Prices are around 7,000 escudos (about $34 USD). One of the most beautiful dining rooms in Lisbon, with a verandah overlooking the Tagus. Located in the Alfama, this moderately priced restaurant serves typical Portuguese food, such a shellfish stew. Prices are around 3,000 escudos (about $15 USD). Open from Monday - Saturday from 12:30-3pm and 8pm-midnight. Like most of Europe, the winter months provide the best bargains and the fewest crowds. 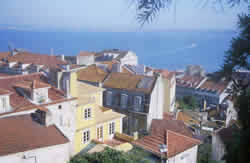 But unlike other parts of Europe, Lisbon has moderate temperatures during the winter, although this is its rainy season. Spring or fall travel usually provides the best weather with lower prices and fewer tourists. English and Spanish are both widely spoken in Lisbon. Taxis are inexpensive and readily available, but Lisbon is small enough to be easily navigated by foot. The tram is also a fun way to get around the city. Lisbon is one of Europe's least expensive cities, and the strong dollar has made it an even better bargain. The currency is the Escudo. As of May 2001, 1 American Dollar was worth about 204 Portuguese Escudo. Open: Apr-Sept daily 9am-9pm; Oct-Mar daily 9am-6pm. Admission: 500 escudos (about $2.20). Open Tues. to Sun., 10 to 5. Admission: 400 escudos (about $1.78). Open Tues. to Sun. from 10 to 5 (10 to 6 in the summer). Closed Mondays and National Holidays. Admission: 450 escudos (about $2). Open Tuesday to Sunday from 10 to 5:30. Closed holidays. Notice: This information is current as of May 2001. It is recommended that you contact the numbers, and/or visit the websites above to determine any changes to the information.